If you have visited this page in the past, you will notice I have removed some pictures that previously showed some cellular telephone towers located around town. Due to RTLI's shifting focus of only showing AM/FM and TV sites, these pictures have been removed. In St. George there are three AM radio stations around town. Unfortunately, I only have a picture of one, due to the lack of time spent driving through St. George. I can count on my fingers the times I have been down there, and most of the time it is just passing through. The only significant time I spent in town was due to an unforeseen big car repair while I was working for KBER in Salt Lake City. The story goes, I was down in Mesquite (30 or so miles to the southwest of St. George) broadcasting from a casino for a live show. This took place in early January 2010. I drove the station's vehicle down there and was stranded when it's transmission decided to fall out onto Interstate 15. Given the vehicle is a diesel, it could only be repaired in St. George and was towed there while I was stuck in Mesquite. When the car was finished getting fixed, 5 days later, I took a shuttle to St. George and picked the car up. While I was in town, I went tower hunting but missed out on two of the area's AM signals. But enough of the story, lets get to the pictures! The first broadcast band tower you encounter when entering St. George from the north is the country music playing monster signal on 1210... KHKR. KHKR is licensed to Washington, Utah. Its tower is right next to Interstate 15. When it was known as KUNF, the station was an ESPN Radio affiliate. Its signal has been heard all over the mountain west. This image is also seen on the station's Wikipedia article, linked below. Wikipedia Article with full resolution version of picture above. While stuck in St. George waiting for the truck to be fixed (see story at the top of the page) I had time to check out a small portion of St. George and snap some pictures. The old picture I had of Webb Hill was of terrible quality and small. Below is the current state of Webb Hill, which is located about 4 miles south of downtown St. George. It is hard to miss this mountain from any direction entering town. Click the picture to see the full resolution version. 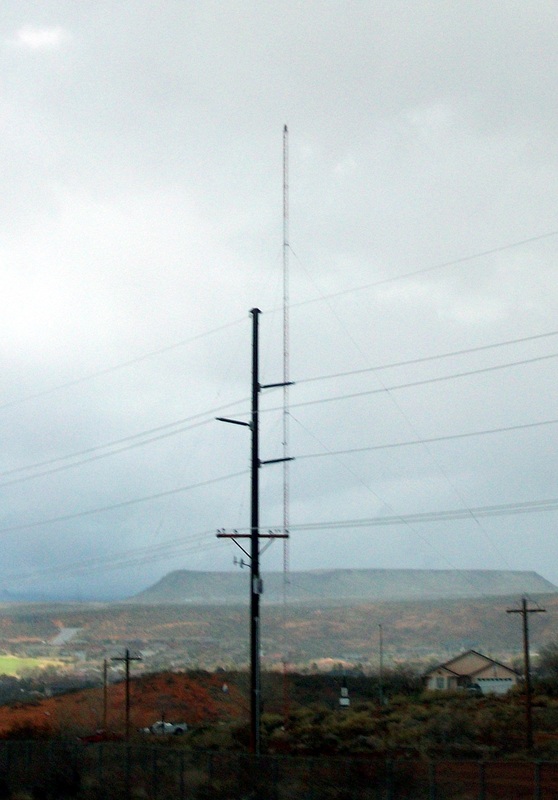 Television transmitters on Webb Hill (as of August 2015). Notice, this information below may not indicate the current state of television broadcasting from Webb Hill. It is likely that the Salt Lake translators and low power stations have already turned off their analog signals if they are broadcasting in digital. This information overlaps the FCC database prior to the digital transition and after it. Channel numbers are RF channels, and are subject to change. Corrections are always welcome. Webb Hill has a Wikipedia article, which also contains information from this very site. Note, almost all the information on said Wikipedia article above was written by me, and is available under the Creative Commons Attribution-ShareAlike License. Since I wrote the entire article as featured on Wikipedia (minus a few updates), I hereby certify that information on this site is exchangeable between this site (RTLI) and Wikipedia, should a problem arise.